Founded in the late 1800’s, the Grand Hotel National was managed by none other than Cesar Ritz in its early years, well before his name became synonymous with luxury hotels and exceptional service. Unsurprisingly, classic styling is the theme throughout, and it is no surprise that the hotel has been a perennial favourite of the rich and influential. Famous former guests include Elizabeth of Austria (also known as “Sissy”), while in 1920 British Prime Minister David Lloyd George met for talks with the Italian President Giovanni Giolitti. 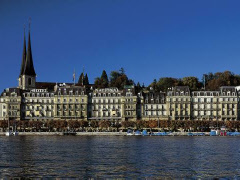 Five-star rated, the Grand Hotel National features 41 guest rooms, indoor swimming pool, and some fine view across Lake Lucerne and the Alps. It also boasts three restaurants: Trianon, Il Padrino (specialising in Italian cuisine), and Thai Lotus.